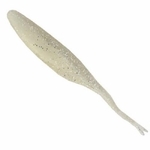 Soft plastic curly tail minnows are great for all kinds of fishing. Our minnows will give you the best swimming action to help catch the big fish. These are meant for freshwater fishing, but a we've now started using our saltwater grade soft plastic for the 4" minnows, which means they will work great for saltwater fishing also. Great for smallmouth, largemouth, walleye, striper, sea bass, etc. When you get a product from Lockett Lures, you know you're getting the best quality available, at a price you can afford.